Call-and-response is a fundamental feature of any creative activity. A call is made by someone or some event that elicits a response from another. The response could be simple acknowledgment of the call, but when it comes to creative work, the response is an informed response built up over time as a result of practicing one’s skill or craft. Problems, of course, are a call, and can exist in the arts, in the physical sciences, or in the social sciences such as business. At work, we have lots of problems. Do we react to those calls quickly or slowly, and how well do we respond to those calls? In many cases, we respond late, timidly, or not at all. Why? In most organizations, it is a sign of weakness or ineptitude to have a lot of problems. This perception is driven by organizational politics (behavioral waste) which forces people to hide problems. No call, no response. Appearances indicate “We’re doing a great job!” But, the reality is vastly different. This is an example of the destructive nature of organizational politics, which board members and senior executives usually ignore. They accept organizational politics as “just the way things are,” dooming the good people and the organization to periodic failure. This is the way in which bad leadership cripples information flows in an organization. Overt and covert forms of blame silence the calls and those who would otherwise eagerly respond to them. 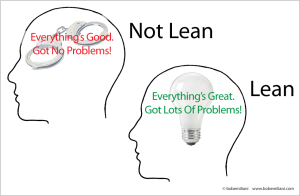 In Lean organizations, we try to get people to accept that fact that everyone has problems, CEO at the top to persons at the bottom, and teach them effective ways to quickly comprehend and correct problems. It is an effort to assure the calls (problems) are not silenced so that people can respond to them immediately. No organization is perfect, and even great leaders sometimes slip-up. But if the consistent pattern of behavior is to blame people for problems, then the call-and-response mechanism needed for creative problem-solving quickly becomes disabled. This is where informed leadership is so important. Leaders who understand cause-and-effect when it comes to how their behaviors affect other people are all too rare. Whether self-taught or taught by a capable teacher, they have learned to become a better person and also how to harness the power of people – nearly all of whom want to think, learn, and improve. The desired outcome is people who take the initiative when a problem arises because the problem is interesting and because it is a challenge. The problem needs to be worked on, understood, and corrected, and so people willingly engage. This is what both good leaders and bad leaders hope for. But, the leaders who blame people for problems can hope all they want. They will not get this outcome, which they loudly complain about, because people are coerced into problem-solving. People ignore as many calls as possible, and, when they do respond, it is sufficient to meet only minimum requirements. In my case, I heard the calls of bad leadership and Fake Lean from my work experience in industry, not as some interesting academic topic to study. I responded to them through two decades of practical research and by explaining my findings in innovative and creative ways that people can easily relate to. Fortunately, working in a university allows faculty to undertake such work even if university leadership is poor. I have also heard the call of bad teaching and creatively responded to that as well.